After a brief hiatus I am now back in wine country, and an entirely new country has welcomed me with open arms. The question is, what country is that; Spain or Catalunya? The Catalan people are convinced that they should be separate from the rest of Spain, as they speak a different language and have their own unique culture. As it is the first part of Spain I am visiting or have ever visited, it is difficult for me to say whether or not there is a big difference, but much like Italy I am excited to find the differences between each part of the country. I am spending the next six weeks in Spain and Portugal, mostly working in a clockwise direction, and thankfully I seem to have a very reliable, fuel-efficient car that is not too small and drives very nicely (a Citroen C4). I arrived in Barcelona last week and spent the weekend there. It is a lovely city, and is one of those modern cosmopolitan cities that everyone should visit, but I did get the distinct impression that it is more a reflection of Europe rather than Catalunya or Spain. There is certainly a fantastic night life, and the beaches are great, but prices seem to be a little higher and it is harder to find good authentic regional food there, as a lot of the (particularly young) inhabitants want more international food. 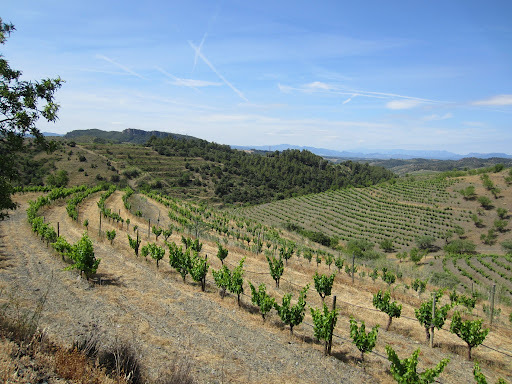 Anyway, on Monday morning I headed south-west to Priorat to discover one of the most talked about wine regions in Spain. 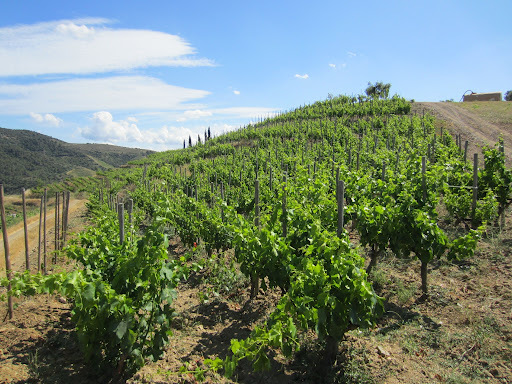 The Priorat region has a long history of viticulture dating all the way back to the Roman era, and previously had one of the strongest reputations in Spain. With political and environmental turmoils of the 19th and 20th centuries in Spain, the region was almost entirely abandoned, and after WW2 the focus shifted away from quality towards volume. Roughly 30 years ago a new wave began, as a group of passionate vintners rediscovered the area and the treasures it offered. One of these pioneers was Alsatian-born Rene Barbier, who is an unashamed terroirist. Considering where he comes from, it is probably not surprising that he is a firm believer in biodiversity, organics and biodynamics, but these practices probably aren’t as difficult to implement and practice here as they are in Alsace. Through these practices he is best able to translate his terroir in the fruit and wines he produces. This transfers through to the winery where he limits the amount of contact he has with the wines, to best represent what nature has provided and he has tended. One of these practices is to use a very old press to gently squeeze the wine out of the must, and regularly taste the wine during the press to stop it once it is becoming too tannic. 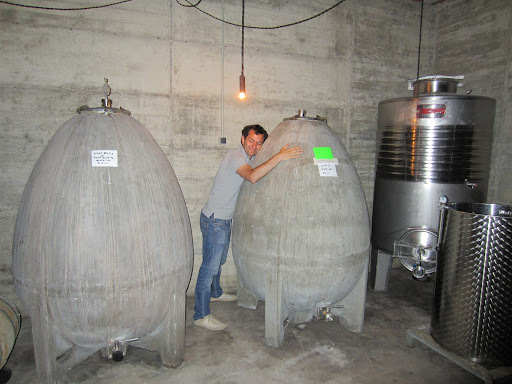 Another way is fermenting the wines in cement, including the egg-shaped vats which I have found in a number of biodynamic producers’ wineries, which imparts nothing on the wine. I think it is a good sign that from the very first appointment I had in Spain I was taken on a pretty extensive vineyard tour, which is where I was able to appreciate the hard work Rene has done in his vineyards. The trellising here is a mixture of head trained bush vines and some cordon trained vines, planted mostly on terraces that follow the contours of the very hilly terrain. 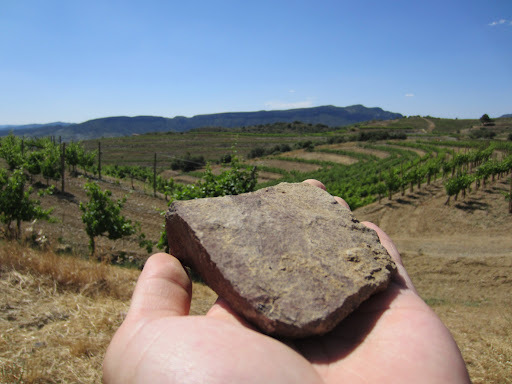 Priorat is characterised by very slatey soils that aren’t found in any other region in Spain, and contribute a very mineralic influence on the wines. The darker schists also retain a lot of the heat of the day, so the vines and berries can get quite stressed during summer. As it doesn’t rain much, you generally end up with extremely concentrated fruit and tannins with very small yields (around 300 grams per vine maximum), which is one of the reasons why these wines are so revered but also expensive to produce. One bottle of wine takes about five plants! Originally Rene planted a mixture of varieties, much of which was cabernet sauvignon. As he discovered that grenache/garnacha and carignan were more suited to these conditions he began to plant more of these and get rid of the cabernet. The cabernet sauvignon does make an important contribution to the wines though, and with the original vines he planted reaching 30 years he is placed ahead of almost everyone else in the region for the opportunity to produce high-quality fruit from vines well adapted to the environment, truly expressing terroir. Under his own label he only produces three wines, the two reds being single cru wines. In a mixture of French, Catalan and English Rene and German-born Katja led me through a tasting of the wines after a tour of the winery. Amazingly the wines didn’t really show their varietal characters, but merely their origin, confirming the terroir-driven attitude Rene has. Much like the vines he grows, Rene’s roots in Priorat are deep and mature after over 30 years here. Click here to read my tasting notes. Considered to be one of the finest winemakers in Spain, Alvaro Palacios departed his home in La Rioja and his family of countless generations of wine production, to begin a new chapter in the only just rediscovered region of Priorat. He was invited to the region by my previous host Rene back in the late eighties, along with Swiss-born Daphne Glorian who established Clos Erasmus, after the three met at a tasting. Initially it was very difficult for the three of them; at the time Rene was selling his fruit but wanted to make his own wine, but had no winery. Alvaro and Daphne purchased some of their own vineyards, and the three of them started to make their wines in the same facility in Gratallops. The bureaucracy did not make it easy for him when he wanted to build his own cellars, particularly when he wanted to put in an apartment that he could stay in when he was in the region. Sense prevailed, and he was able to build one of the first world-class facilities that was the envy of the region. Driving around Priorat today you see a lot of new facilities that have gone up in the last ten years, a testament to the attention and acclaim that people like Alvaro have brought to the region. From only five producers 20 years ago to over 90 is a pretty big leap. For the visit I was joined by a group of people (that I wasn’t informed about), and we were hosted by the Estate Director Oriol Castells i Gasulla. Continuing the trend the first thing we did was to take a tour through some of the vineyards, many of which are in the same areas as Rene’s (not surprising really). Alvaro similar to Rene initially planted a lot more cabernet sauvignon, merlot and syrah, but has recently been grafting across a lot of it to grenache and carignan. The natural amphitheatres of many of the vineyards create their own mini-terroirs, and with the steepness of the slopes and the nature of the vine trellising, hand-harvesting and low yields are the order of the day. Alvaro is well-known to be the last to harvest his fruit, particularly on the most prized vineyard, the Ermita, which produces one of the most sought-after wines in Spain. The fermentation and maceration are usually at higher temperatures (up to 30 degrees), and can last for 30 days. 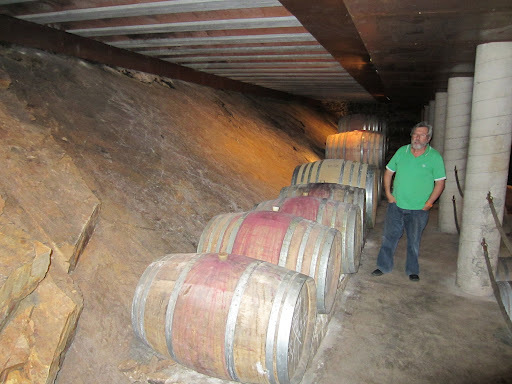 For the higher wines he prefers French-oak barriques, and matures them for many months before bottling. I am keen to visit some of the other Palacios estates to see his winemaking techniques there, because in comparison to the wines of Clos Mogador the Palacios Priorat wines were very bold and extractive showing a lot of oak notes, and at only two years of age are barely expressing anything. My inexperienced assumption was that this was his Riojan influence showing through. I hope at some point to have the chance to taste some of his wines with several more years of age on them, as tasting these wines I couldn’t see the personality of the origin, just a lot of fruit, tannin and oak. Click here to read my notes on the tasting. Click here to see more photos from Day One in Priorat, Spain. On my second day I have twice as many appointments, so stay tuned.